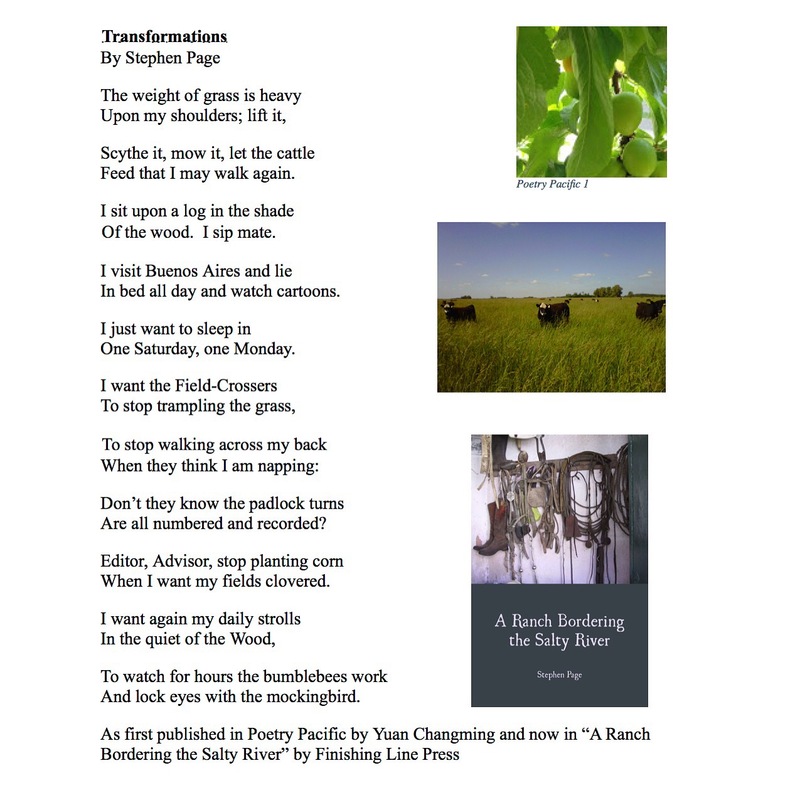 “Transformations”, was first published in Poetry Pacific here: http://poetrypacific.blogspot.com.ar/2013/08/1-poem-by-stephen-page.html?m=1 by Yuan Changming and is now in “A Ranch Bordering the Salty River” by Finishing Line Press. #aRanchBorderingTheSaltyRiver is still available for preorder at #FinishingLinePress here: https://finishinglinepress.com/product_info.php?cPath=2&products_id=2662 and will be available at Amazon.com, Ingham Book Group, Barnes & Noble, ChaptersIndigo, and other major distributors. If you have any problem ordering the book online, you can call the bookstore directly an order over the phone here: 502-603-0670. Bookstores receive a 30% discount for orders of 4 or less, and a 40% discount for orders of 5 or more. Orders of 10 or more are better done over the phone.